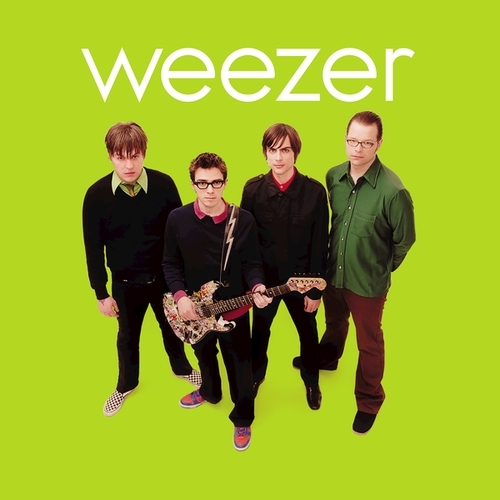 Well, I picked up the new Weezer album today. Even though I had the opportunity for weeks to download the mp3s, for some inexplicable reason I decided to wait for the official release. I didn’t even go to Vertigo Records yesterday to beg my man Herm to sell me one a day early like I did five years ago when Pinkerton came out. Back in 1996, it was embarrassing for a guy my age (25 then) to be excited about the new Weezer album. But by that time I had already accepted the first Weezer album as a pop masterpiece, and thanks to my man Colin, I’d already totally gone crazy over the moog madness of the Rentals’ first album. Since then my love of Weezer has not waned. I’m a nut — ask any of my friends or especially my wife. I get obsessed about bands and burn myself out. I inherited this trait from my cousin Mike who first turned me on to the full power of music in the form of those Knights In Satan’s Service, KISS. When the King died, Mike and I went on a huge Elvis kick. His older Dazed and Confused-era brother got us into The River and then the Doors. AC/DC was in there somewhere — probably when Bon Scott died. As we got older, Mike and I drifted apart as he fully embraced the Metal side of things and I queered off into Duran Duran, Tears for Fears and, heaven forbid, Wham! I eventually ended up with the Beatles, the Smiths and the Dead Milkmen as my high school soundtrack. The Stone Roses were coming up as I graduated. And for each of these bands, I became totally obsessed and had to hear everything they ever recorded and read every interview they ever gave. This was a lot tougher back in the days before the Web and Napster. I had pen pals in the UK who would record radio performances and send cassettes to me. I became a bootleg tape trader. It’s ridiculous. College broadened my musical horizons but it didn’t chill me out at all. Neither has marriage. I’ve gone crazy about britpop, Parliament-Funkadelic, NWA-related hip hop, Frank Sinatra and Neil Young. There are tons of other bands that I was into that are more embarrassing, but you get the picture. 11/15/2000: …Well, today weezer was visited in their home studio garage by the president of Geffen records, whose views of what weezer was doing were fairly unknown to date. We found out today, to the bands delight, that he is a very cool guy who thinks the new songs are "awesome", and he had lots of good ideas and suggestions for the band as they continue to write and record brand new songs and refine the slightly "older" ones from the past few weeks. 01/06/2001:…recording day 10… In the midst of finishing up Mikey’s bass "fixes", Weezer recieved a visit from the record company, and were suprised to learn that they were unsatisfied with how several tracks were turning out so far. Despite the fact that the songs are in a very raw form and will be much farther along in just a few weeks, the comments were still fairly critical, even while other songs got positive remarks. This of course is not the best news we could have gotten, as dissention from "on high" can lead to unwanted delays. And as we all are aware, there is very little margin for error here. Extending the album sessions could adversly affect the tour schedule, and conversely, sticking to the tour schedule in spite of not finishing the album work could mean a delayed release. Both of these outcomes are the last thing anyone wants, so the guys are continuing to work extra hard to get all the tracks as top-notch as possible. …Very lengthy debates and discussions of what should/shouldnt/could be done with the tracks led to renewed attempts to nail down some songs. Later, after intensive internal debate within the band, a few songs got "the boot", their slots in the final running taken over by others that were "bubbling under". Additionally, another song, "Gonna Make My Move" was given a first time attempt. 01/07/2001:…recording day 11…The hard work is really paying off, and the guys are determined to make this album their own way. Suggestions and criticisms come in all flavors, and some are helpful, some useless. Ultimately, weezer is duty-bound to deliver exactly the album that they want to hear, untainted by even the slightest of compromises, and they can only hope that that’s the same album that everyone else wants to hear. I attended the concert in Chicago on March 9, and wrote about how oddly unsatisfied it had left me feeling. The new songs sounded good. The old songs sounded just like the recorded versions. They didn’t play for very long. But I think my biggest problem with the show was that I spent most of the time up in the balcony where it was too quiet and comfortable instead of being down on the floor where I belonged. My fault. I won’t make that mistake again. 04/12/2001: …Speaking of release dates, some folks have been writing me in a panic, having heard of further delays to the US release. I can assure you direct from the band itself that this is NOT so, and that may 15th is the date! It is true that the record label had tried to further push it back till June, but this did NOT go over well with the band…in a heated behind the scenes debate with some label higher-ups, the exasperated guys got their way, and May 15th stuck! "That was a devastating disappointment," says Cuomo, 30. " ‘Cause at the time I felt we had come up with something really new and fresh and exciting and important. It was very personal to me also. "And we put it out and everyone said they hated it, just across the board—our fans, all the critics. It was just the worst stab in the heart. And that was definitely one of the factors that led to me not being able to leave my room for a few years." "I don’t expect it to succeed commercially, unlike everyone at the record company," he says. "They’re all gonna be incredibly disappointed in a few weeks. "The thing that I’m worried about, and this is a real concern, is that I also think our fans are gonna hate it." "There were songs on the [first] album that were pointing the way to a personal, confessional style, and that’s what I got really excited about as I went to do ‘Pinkerton.’ But now I’m just totally closed. I think they’re gonna miss the extreme emotionalism. "They’re gonna say, ‘He doesn’t sing with any feeling anymore, he’s not letting his feelings out.’ And the truth is, I miss that too. But all things considered, I think this is a stronger record. This record stands on its own without having to manipulate people’s emotions." And it’s true the new album seems to completely lack the extreme emotionalism that I love about Pinkerton and parts of the first album. And it doesn’t have any weird sounds. Nothing that makes you stop what you were doing and say, "What the hell was that?" It’s a good record with some really nice songs on it. But I can already tell that it won’t make it in my CD player past the summer. There are no songs that I absolutely have to put on mix tapes for my friends, like "No One Else" or "Across the Sea" or even "The Good Life." I like the single, "Hash Pipe," but I don’t really care about it. We’ll see. Maybe I’ll change my mind. Lester Bangs hated Exile on Main Street when it first came out. But I’m pretty sure that the new Weezer album is no Exile. I mean, it’s less than 29 minutes long, and come on, they didn’t even bother to give it a name. Has there ever been a band to release two separate self-titled albums? But I’m still a fan. And I’m anxious to download the b-sides and outtakes and new live stuff. And even though I feel let down, I’m already excited about their next album. "I would like to say one thing, and that’s that I hope people stick with us. All these records are just phases I go through, and when you’re younger and kind of inexperienced, you go through more extreme phases, and ‘Pinkerton’ is maybe on the emotionally extreme side. "This record is on the anti-emotional extreme side. And I hope people stick with us, because in the future I’ll be going back and forth and probably finding some middle ground that makes us all happy." Let’s hope this one sells millions of copies so they feel liberated enough to follow it up with a little bit of forward evolution. Is that lame of me to even think that way? Am I being suckered by a corporate marketing machine into consuming goods I don’t even enjoy? I honestly don’t know. After all, I’m just a fan. Personally,I enjoy the extreme emotion of Pinkerton, but that could just be because I’m a younger fan. But I do understand the thing about growing up with the music, it is true. Just sayin’, but these bands/artists released more than one self-titled album: Weezer (duh), Peter Gabriel, Seal, and Cheap Trick. There very well may be more, but I’m not sure.